Plaque commemorates those who served on the Royal Australian Navy Corvettes which escorted wartime convoys, rescued seamen from drowning, attacked and sank submarines, and bombarded enemy positions during World War Two. They ferried soldiers, surveyed uncharted water, landed spies and Special Forces, and shot down aircraft. They were there until the bitter end when Singapore fell, and their crews later claimed to have liberated Hong Kong. Four Australian corvettes were in Tokyo Bay for the final surrender of the Japanese in 1945. RAN corvettes served in the Pacific, the Java Sea, the Indian Ocean, the Persian Gulf, the Mediterranean and the Atlantic. 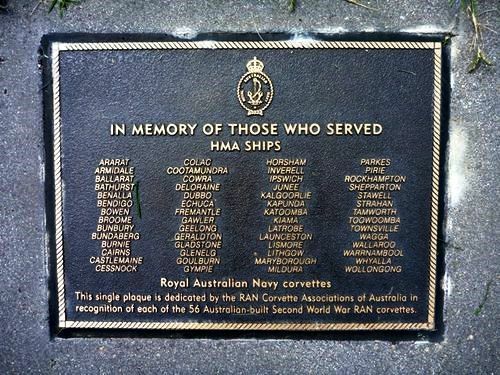 This single plaque is dedicated by the RAN Corvette Associations of Australia in recognition of each of the 56 Australian-built Second World War RAN corvettes.